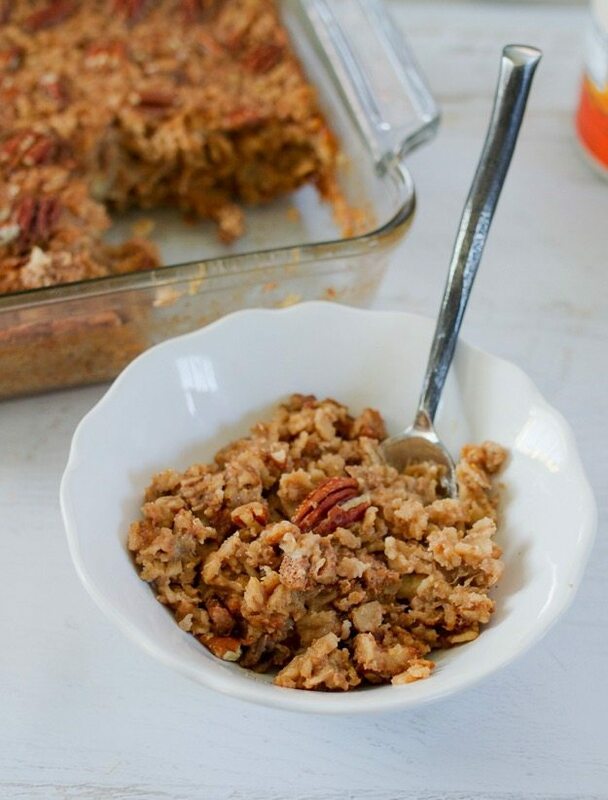 This Maple Pecan Baked Oatmeal is filled with wholesome oats, studded with chopped pecans and lightly sweetened with pure maple syrup. Fancy enough to serve for brunch, but awesome as a make-ahead breakfast for the week as well. The Monday after Christmas is always hard, but thankfully another holiday is just around the corner. Are you ready for 2016? Any big New Year’s Eve plans? Are you setting any resolutions for yourself? As for resolutions, I don’t normally set any but I do have a running list of things I’d like to do in 2016. I already have a feeling it’s going to be a big year for us. 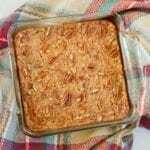 Taking it back a few days, I promised I would share the oatmeal bake recipe I made for Christmas morning brunch so here it is. Isn’t it pretty? Luckily it tastes just as good as it looks. The oatmeal bake was the perfect dish to accompany the egg dishes that we’re also served and my family loved the maple pecan flavor. 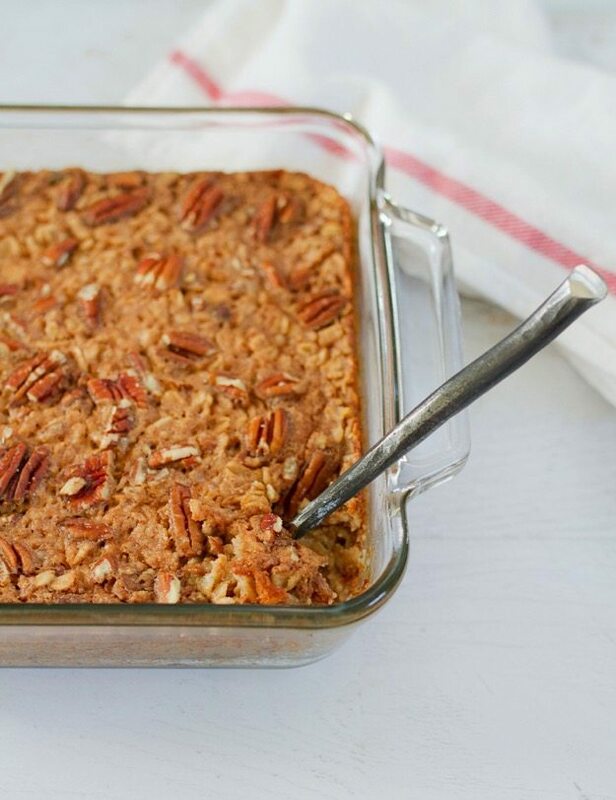 I’ve always been a stove-top oats kind of girl, but after this recipe I may be a baked oatmeal convert. Two reasons. 1) As someone who loves all things crispy and crunchy baked oatmeal is where it’s at. The top layer gets golden brown and has a little crunch to it — especially when you get a bite with a pecan in there. Yum! 2) The leftovers are awesome. You can eat them cold straight from the fridge or reheat them. Either way, the leftover baked oatmeal makes for a quick and easy breakfast option. I can totally see myself making a batch on Sunday for the week. The maple pecan flavor combo is rich, nutty and sweet. It kind of reminds me of maple & brown sugar instant oatmeal packets I used to eat all the time growing up. 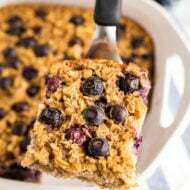 Although, this version is a bit healthier and more filling with whole grain rolled oats, healthy fat (from coconut oil and the pecans) and pure maple syrup which has over 54 antioxidants and a boost of minerals such as iron and manganese. Just be sure to use pure maple syrup, not the artificial kind labeled “pancake syrup” and made from corn syrup… NOT the same! 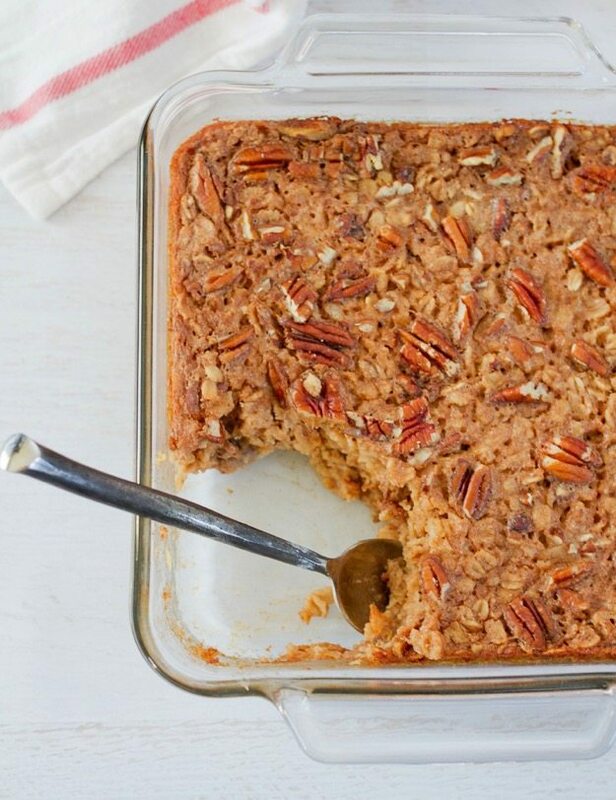 Whether you’re serving brunch to a crowd or just doing a little meal-prep for the week, I hope you enjoy this oatmeal bake as much as we do. Spray an 8-inch square baking dish with cooking spray. 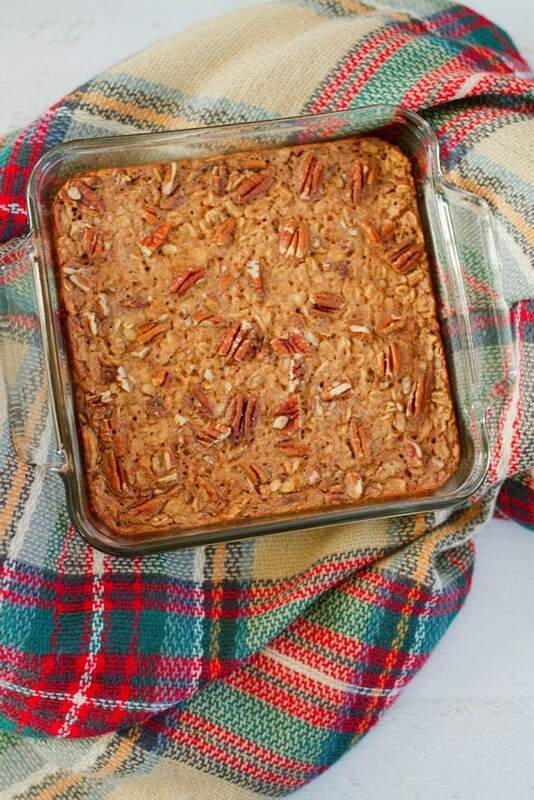 In a large bowl, mix together the oats, half the pecans, baking powder, cinnamon, and salt. Add in the milk, maple syrup, egg, coconut oil, vanilla and bananas. Stir well to combine. Carefully pour oatmeal mixture into the prepared baking dish. Scatter the remaining pecans across the top. Bake for 35 to 40 minutes, until the top is nicely golden. Remove from the oven and let cool for a few minutes. Portion and serve. Drizzle each portion with maple syrup if you want it a bit sweeter. If you decide to try this recipe, please let me know how it turned out in the comments or share a photo on social media. Just remember to tag me @eatingbirdfood so that I see it! This post is part of a partnership with Pure Canada Maple. Maple syrup is one of my favorite natural sweeteners and as always, opinions are my own. This breakfast looks incredible and I think I have most of the ingredients already in my kitchen! I’ll definitely be trying this soon! i love the crunchy, crispy parts of food so I think I’d love this recipe too! And maple + pecans is such a timeless flavor combo. Cheers to lots of happiness for you in 2016! This looks so delicious! I’m typically more into stovetop oats, but I might change my mind after baking this! I also love the inspiration board idea instead of a New Years’ resolution. I’m moving in July/August, so I think I’ll create a list of things I want to do/see before I move. I love oatmeal in any way, shape or form. Going to give this a try. 🙂 Thanks! I’m definitely going to make this for sure! All I need is my maple syrup. OH My glory….this was so delicious!! Please use ripe bananas. I didn’t drizzle any extra maple syrup because it did NOT need it. Thank-you so much for sharing this recipe. No more boring oatmeal days for me. ☺???? 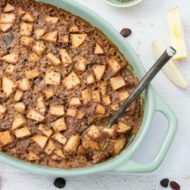 Could I substitute steel cut oats? I haven’t tried it with steel-cut oats but I think it would work. You’ll just have to bake it for longer in order for the oats to cook. Probably around 55-60 minutes, but start checking it at 45 minutes. Let me know if you try it. This recipe is incredibly good. My 11-year-old loved it too. This is a keeper! I added walnuts as well. Couldn’t resist the temptation to do a incorporate the banana bread flavors. Turned out great! After it was baked I drizzled an individual serving with a quick blueberry sauce made from frozen blueberries, lemon juice, stevia and arrowroot starch, and then a dollop of dairy free yogurt. Tomorrow’s serving will be topped with a drizzle of almond butter and almond milk sauce. Everyday it be something new again! Thank you for the recipe!! Oh, I love the idea of switching up the toppings every day. And your blueberry sauce sounds heavenly!! I think apple sauce would be a good substitute! Maybe use 1/4 – 1/2 cup? Delicious! We made this for breakfast, substituting Steel-cut oats (bake for 50 minutes), and substituted 1/3 c. dried cranberries for the banana; we served topped with a dollop of honey flavored Trader Joe’s Greek Yogurt. Even my little one who turns her nose up to oatmeal asked for seconds. 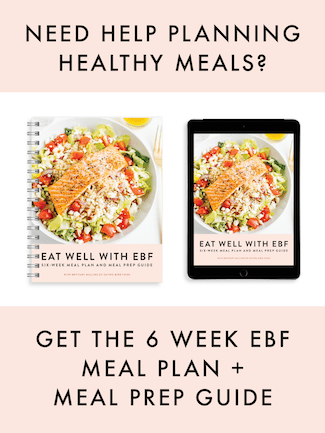 I made this for my make-ahead weekday breakfasts and it is perfect! I love that it’s not too sweet. I will make this again and again! Thank you. I finally tried it and have made the recipe for our weekend breakfast for the last two weekends. Delicious! I’ve made this recipe many times since I first found it. My husband does not eat fruit, so I make it without the bananas. We both love this! I am making some for our Mother’s Day Brunch and know it will be a huge hit. Thank you so much for sharing this wonderful recipe with us! I just made this. Delicious! I used a little more nuts, mashed the bananas, and used butter instead of coconut oil and whole milk instead of almond milk. I’ll be looking forward to breakfast this week! I have a daughter who is celiac sprue so gluten free is a must if we eat together, but my hubby is not a maple fan. What could be used instead? Honey should work well instead of the maple! When you say flax seed instead of an egg do you mean whole seeds, ground flax seed or a flax seed egg? Also, I plan to use homemade almond milk. I am hoping it does not need the thickeners that are in commercial almond milk. Hi Lauren. Great question. If you want to make this vegan or egg-free, I’d just add 1 Tablespoon of ground flaxseed to the mixture! And I think your homemade almond milk will work perfectly. No thickeners needed. I tied this today – not a fan. Not a fan – too dry and I didn’t care for the maple and banana taste. I like reheating a single portion by putting it in our toaster oven on 350-375° until it’s warm throughout. If you don’t have a toaster oven you can always place one serving on a plate or in a bowl and microwave it for 20-30 seconds or until it’s warm throughout. Enjoy! We soaked the oats (steel cut) in milk overnight, then added other ingredients and baked it in the morning. Great! Omg did anyone notice the calories fat and carbs omg not fir those watching their weight ! All healthy fats and healthy carbs. And you only have to eat a small portion to fill yourself up. Oats, eggs, and bananas are filling and will keep you satisfied until lunch. could you make these in a muffin tin to freeze and pull as needed for breakfast? how long should they cook in a muffin tin? I haven’t ever done this recipe in muffin form, but I have with other oatmeal recipes like my baked banana oatmeal cups: (https://www.eatingbirdfood.com/baked-banana-oatmeal-cups/). For this one I’d probably turn the oven down to 350 and bake for 30-35 minutes. Let me know how they turn out! I loved it! I used 2% milk in place of almond milk and I drizzled over some maple syrup while it was hot! Wow – easy and delicious. I am not counting carbs or calories but I do eat low sodium and gluten free fruits of the earth so this was perfect! Also I will make six servings of this instead of 4 as in the nutrient count – but in reality it is so good I want to eat the whole pan at once. Thank you! Just made this and it’s delicious! Thank you!!! I did not have pecans and bananas on hand, so I put in chopped walnuts and forzen blueberries instead. It was so delicious! Just commenting back here after the billionth time making this recipe to say it’s one of my favs from your blog, friend!!! <3 I have my sister addicted, too!! I love baked oatmeal, this one was delish!! I used 2% milk because that’s what we use, did not drizzle with maple syrup after because it was plenty sweet. Super yummy! !